My friend bought an online deal to this restaurant and I was thrilled to get to try it out with her. They have a very pretty little outdoor seating area in front, but it was too hot to stay outside so we opted for in. It’s a pretty setting with lovely flower arrangements, but it was mostly empty except for a few tables. The service, considering that there was hardly anyone else to wait on, was polite but very slow and not particularly attentive. On a hot summer day cheesy macaroni with truffles isn’t exactly the first thing I’d normally gravitate to on a menu. 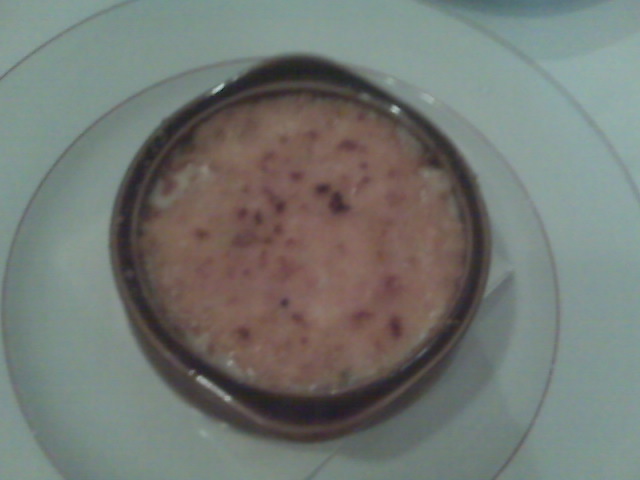 Since the offering was an appetizer, and my friend really wanted to share it, we went for it and it was a good decision. So creamy and delicious with pieces of truffle big enough to see and taste. It was by FAR the best thing we ordered for lunch today. 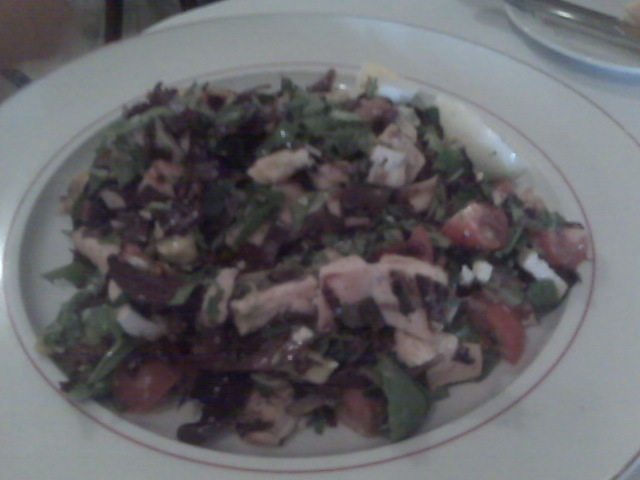 To offset our ridiculous saturated fat indulgence, we both chose salads for entrees. 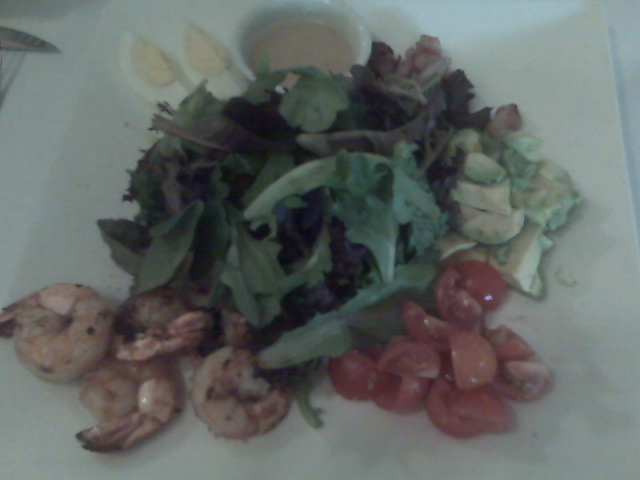 My friend had the chopped chicken salad and I had the shrimp Cobb. Now correct me if I’m wrong, but isn’t one of the key elements in a Cobb salad the bleu cheese? Well, pictured below our mac & cheese is the ONE tiny piece of bleu cheese that came with my salad. Ummm. Really? 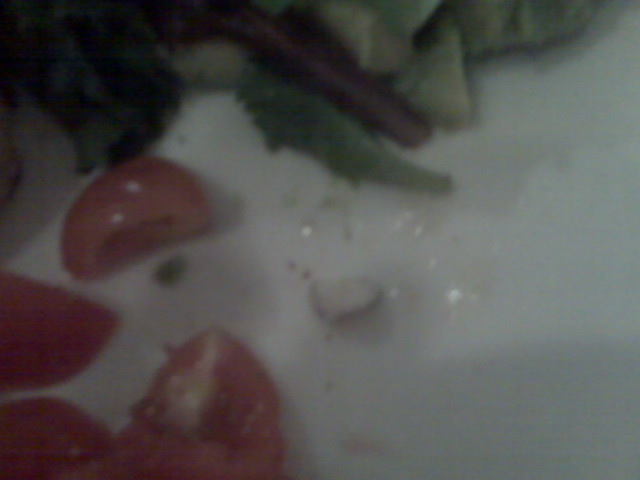 Did this one crumb fall off of another salad or was it deliberately placed there? If the latter, wow that’s pretty f-ing ridiculous. If not, maybe the chef needs to brush up on her key cobb salad ingredients list. By the time the waitress came back to check on us, I had already eaten half the salad and was too full to bother sending it back. She asked if I wanted a side of bleu cheese- but I was already pretty ‘over it’. It was otherwise a pretty poor salad anyway. The dressing was completely boring and not even a little bit original or creative- I’m pretty sure it was just olive oil and lemon. The shrimp were fresh and grilled nicely, but almost inedible they were so over-salted. The tomatoes, given the fact that this is the prime time of year for awesome tomatoes, were very so-so. The bacon was just bad. Chewy thick chunks. Ew. I barely finished half of my entree and was pretty glad we decided to have the appetizer and the yummy bread and butter than came first. So, aside from the fact that my evening run is going to be carb-fueled as if I’m running a marathon and not just a few miles, this lunch was a pretty huge waste of time and money. (Although It was a real pleasure to catch up with a friend I hadn’t seen in a while) All in all, it was such a disappointment that I didn’t even bother considering dessert…and for me and my sweet tooth, that says a lot.